C-SAW Measure C was up in early electoral returns, but then went down to defeat last month. This spring, reporters from around the world descended on Napa County, not to write about Cabernet, Viognier and fine cuisine, but to track a volatile electoral campaign that divided the area. Charlotte Simmonds at The Guardian nailed it when she wrote, "A local environmental initiative has sparked fierce debate." 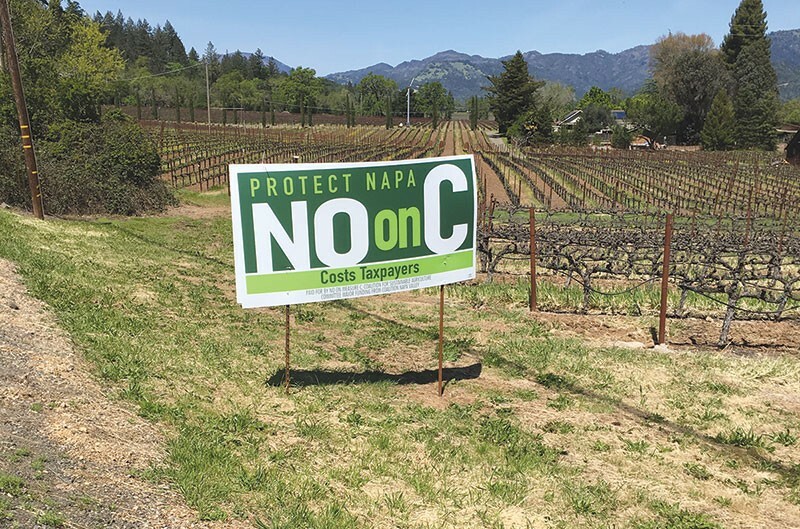 By way of explaining the campaign she added, "Measure C would cap the amount of oak woodland that could be cleared for future vineyards—in effect limiting the growth of some of the world's most famous wine brands." The "Yes on C" forces never put the stakes that bluntly during the campaign. They talked about preserving woods and watersheds, even as many citizens rightly viewed Measure C as a battle cry to limit Big Wine's growth and check the power of hotel-and-wine billionaires. After the measure's defeat, Napa County executive officer Minh Tran told the board of supervisors that in the wake of Measure C, he wanted "to harmonize the community." Harmony will be an uphill battle after a war of words, emotional wounds not yet healed and true believers among the Yes and No folk ready to do battle again. The vote on C took place on June 5, but the Napa Registrar of Voters, John Tuteur, didn't issue a certified count until June 25. In its report on the vote, Forbes magazine scolded him for being "slow-paced," but Teteur had a difficult job. Ballots were damaged or not signed; others arrived late to Teteur's office. Mike Hackett, co-author with Jim Wilson of Measure C, monitored the count and concluded that everything was lawful, though he was obviously disappointed by the outcome. It seemed at first that "Yes on C" would prevail. Then the scales tipped, though not by much. 18,174 citizens voted against C; 17,533 voted for it. At least 7,000 eligible voters in Napa didn't cast a ballot for or against. Many said that they couldn't identify with either side. Measure C won in four of the five Napa County cities, where much of the population resides: Calistoga, St. Helena, Yountville and Napa itself. The only urban area to vote overwhelmingly against C was American Canyon, where watersheds, wineries and groundwater are not (yet) an issue. American Canyon, population 19,454, relies on the state of California for almost all of its water. What next for Napa? The insurgent Napa Green Party called a meeting on July 14 at the Napa Valley Unitarian Universalists. The Institute for Conservation, Advocacy, Research and Education co-sponsored the event that was attended by about 50 citizens on either side of the issue, and by elected officials such as county supervisor Ryan Gregory, a vocal opponent of C.
Ryan managed to surprise the audience at the UU when he said, "The status quo is no longer acceptable." Even in defeat, Measure C rocked the Napa boat. "There's been a paradigm shift," said the Green Party's Chris Malan, who added that next time the advocates for watershed and woodland protections ought to "play hardball" and "expose political corruption." Ryan Klobas, policy director for the Napa Valley Farm Bureau, which opposed C, didn't attend the July 14 meeting, but he has told reporters that experts, not private citizens, ought to tackle complex matters. That attitude helps fuel the ire of the Green Party. At the meeting, Wilson spoke about the "magical quality" of the campaign he helped to start. A young man at the back of the room suggested that protesters chain themselves to trees if they want to save them, though no one echoed his cry. A critic of the "Yes on C" campaign, who had voted for the measure, pointed out that activists had sadly not reached out to Latinos and Filipinos, and that the language of the measure was confusing even to environmentalists. The most upbeat speaker, a woman who had moved from Florida, told the crowd, "You are on the right path" and "I have never seen this kind of enthusiasm." Two activists, James Hinton and Geoff Ellsworth, are both running for public office in Napa. Like their friends and allies, they're ready to rock the boat again, protect watersheds and save the oaks before it's too late. The indefatigable Ellsworth, now a council member in St. Helena, hopes to be the city's next mayor. "I'm running for office, in part because Napa reservoirs are fragile," he said. "We need to protect our water." That could be a winning slogan next time around.